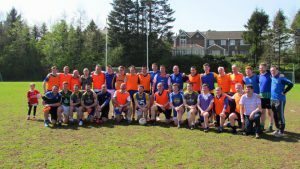 Naomh Bríd’s first Lá na gClubanna event on May 8th was a great success. The club want to thank all players, members, families and the wider community for turning out and making the event such a special day. 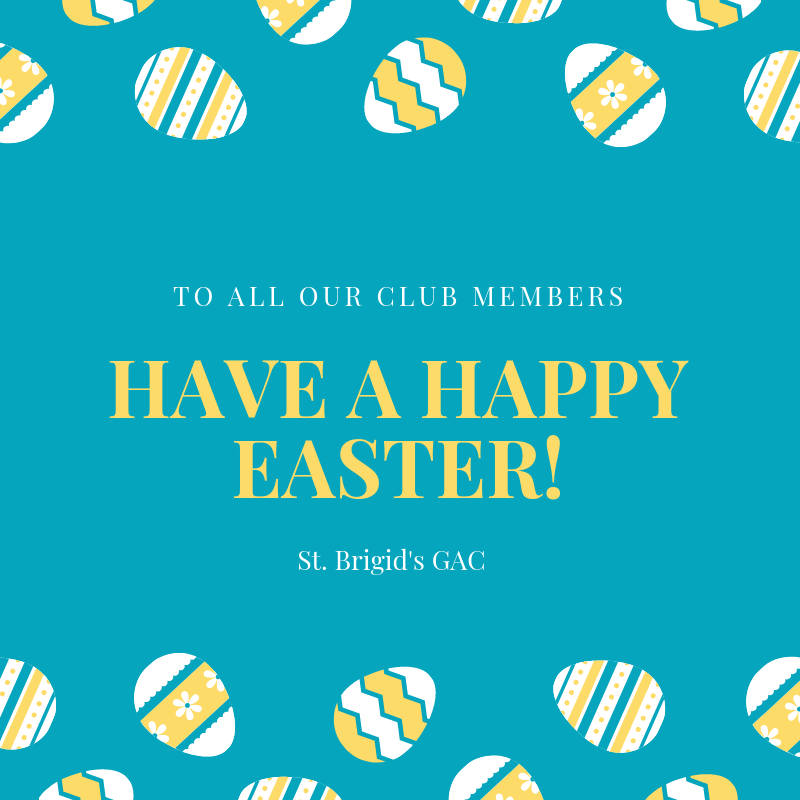 The club day would not have been possible without your support and all the volunteers who helped out with the games, activities and of course on our many stalls. 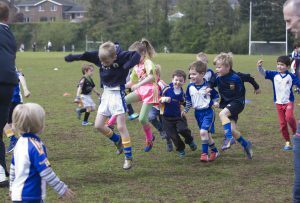 The day got underway at 12 with normal Fun Sunday activities and blitzes (though the children were more giddy than normal!) with the coaches putting the kids through their paces, while some volunteers got the stalls up and running. There will be plenty of protected teeth around Naomh Bríd thanks to the work Stephanie Conway on the mouth guards stall. The face painting was a big hit with the younger ones, even if at times we had to tell some parents that it was really only for the kids! The tuck shop literally sold out of everything: it is amazing how a little sun gets the thirst going. And what can we say about the many practical talents of our club members? 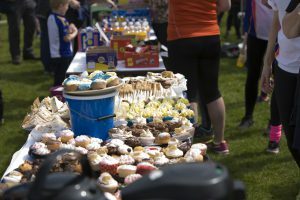 Buns and cakes galore, the crowd could not have been happier when they saw the cake stand and all washed down by specially poured tea/coffee by our wonderful volunteers. The BBQ servers could not work fast enough with the queues but they managed the pressure well in the sweltering heat from both the sun and the BBQ behind them. 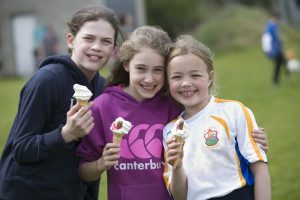 The ice-cream man was also under pressure with the best priced ice-cream in Belfast at 50p a go, a big hit with both real kids and adult kids alike! 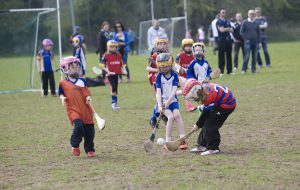 We had lots of new nursery kids getting involved in our introduction football and hurling/camogie sessions, with Martin McCarney and Brian Morrissey stepping in as Brian had to wait for younger brother Stevie to eventually get out of bed. 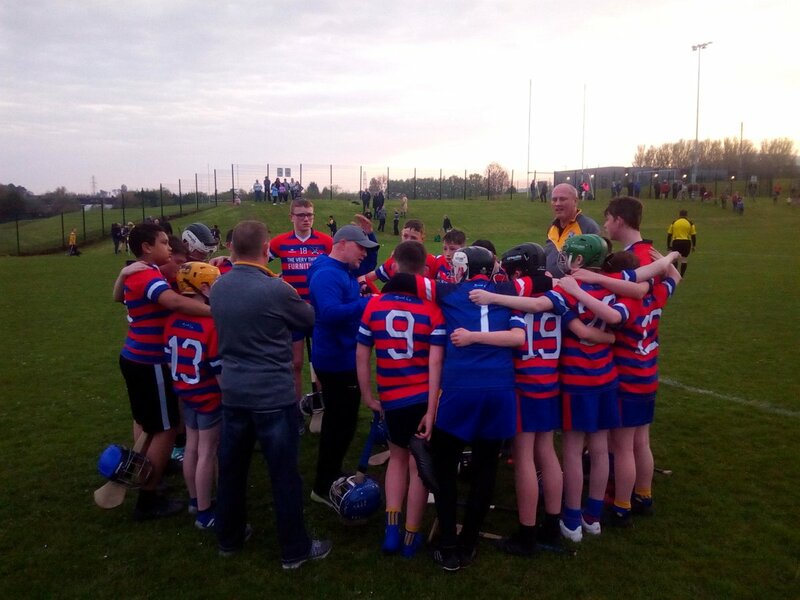 The hurling/camogie sessions were overseen by the watchful eye of Frank McElhatton and helpers to showcase the many ‘small ball’ talents the club have and which are continuously increasing in numbers. 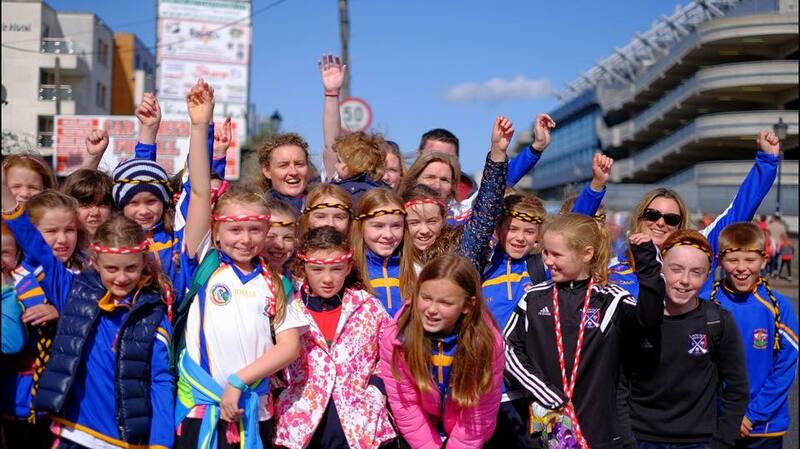 At 1pm our juvenile players started to showcase their many GAA talents. We had a number of mixed teams both boys and girls with great support from the sidelines. Even the refs had to step it up to keep up the young players as they ran circles around them. 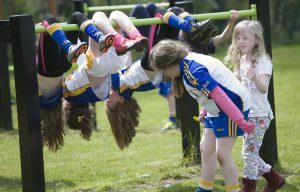 Over at the ‘other sporting activities’ pitch, Muiris and his team were managing serious feats of strength as P1-P6 kids took on tug o’war challenges against each other, followed by some dads reeling back the years and giving it a go. And we had six of the U14 girls team take on about 20 juveniles, and just about win! Unfortunately, we had one injury of the day and the club wishes Lara a quick recovery and return to action. 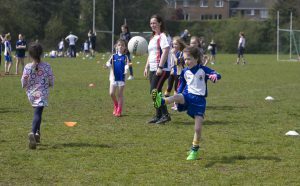 But in the main – from P1 to grannies and grandpas, there was a lot of fun had between hitting the target hurling, penalty shoot outs and monkey bar challenges. There was a great show of skill and comradeship from our G4M&O and senior ladies, that even resulted in a few new interested parties wanting to be part of something special. 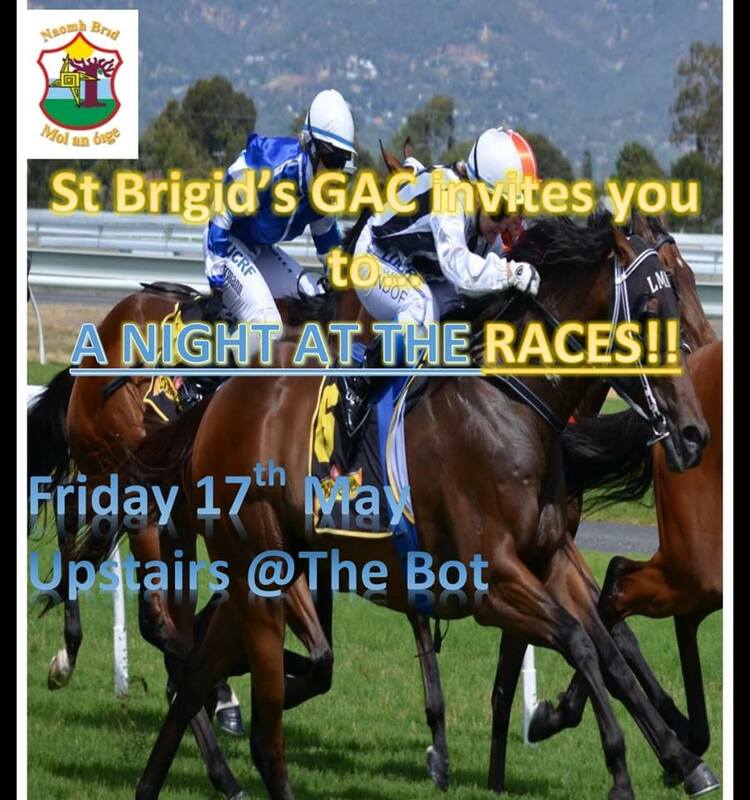 To our finale of the senior men and coaches. The game was meant to be one between mixed teams, but the ever-brave coaches – after sizing up the competition and deciding they were not fazed – said, let’s take them on! That they did and left the senior lads stunned as they ran away with a decent score in the end. A great show of talent from all involved and another first for the club! (Maybe the senior team will point to the extra players the coaches had or the slightly-preferential decisions of ref Eunan Conway!). We even had a super sub Greg Blaney who came on for Peter Mulgrew and after 20 seconds scored a goal from a hand-pass. Peter wants it to be known that his substitution was not tactical but enforced by the need to announce the winners of our fantastic “Design a Fun Sunday logo” competition! 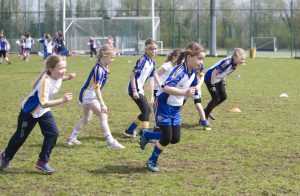 The competition was lauched at our recent GAA demonstration day at Saint Brides Primary School. We had well over 400 entries and the quality of the work was amazing.Judging took place at match last Saturday morning and the winners were picked by our ad hoc judging committee made up of SB coaches and parents. Prizes were a new SB or Antrim shirt for each Primary year’s winner. Runners up got a sliothar and we had club medals for third place. Entries and winners were not confined to Saint Brides and Stranmillis Primary also put in a good showing. Our overall winner was Conor Burke from P6 and he picked up £50 in O`Neills voucher as well as his shirt. Conor, a playing member for several years, designed a beautiful logo which will mark Fun Sunday activities long after he has moved on through our teams. Well done to Conor, our winners and everyone that took part. Just like Strictly as a judge, Mark Sidebottom did not disappoint. Humour and that cheeky grin can get that man through any hard days graft! He duly informed us of where to be and at what time. He cheered on all the games and encouraged us all to put up at least 2 pounds encouraging us all to eat more buns and nearly started selling off the ladies on the stalls in the end by promoting 2 for 1! 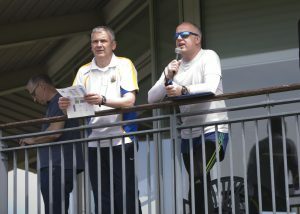 There was great walkie talkie action going on around the pitches, stalls and balcony as Tracy, Peter, Anthony, Muiris, Mark and Gerry made sure all activities and games ran smoothly through the day. 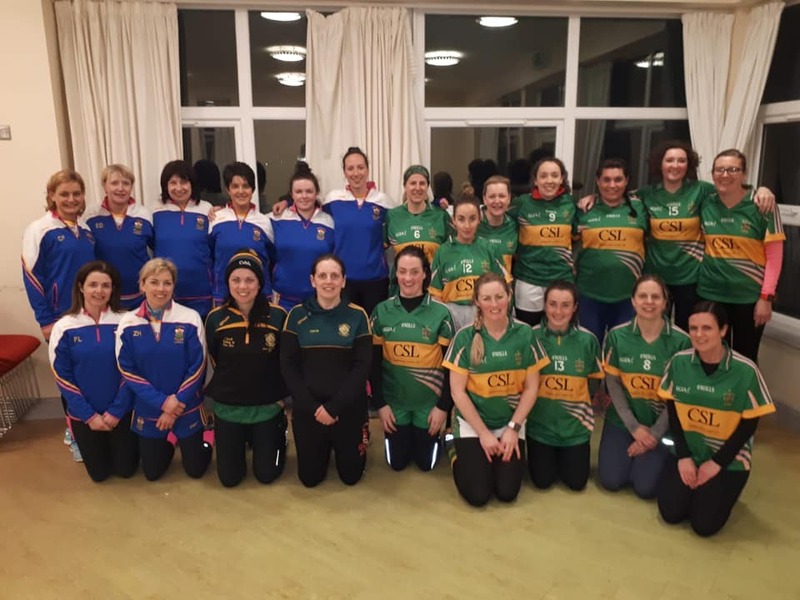 Of course there was plenty of catching up and chatting going on, maybe all the GAA arguments were being resolved by some folk or it was a matter of deciding to go for the third bun but people met up, laughed and even bought some new club gear. Once you entered HQ you were certainly not lost as the two main men our club president Tom Walsh and John Bouge guided you in to your space in the carpark. So a big shout out of thanks to our carpark stewards on the day. The sense of community, laughter, along with a few burnt necks and faces made the day all the more special. So thanks for sharing the day with the club and see you all again next year!